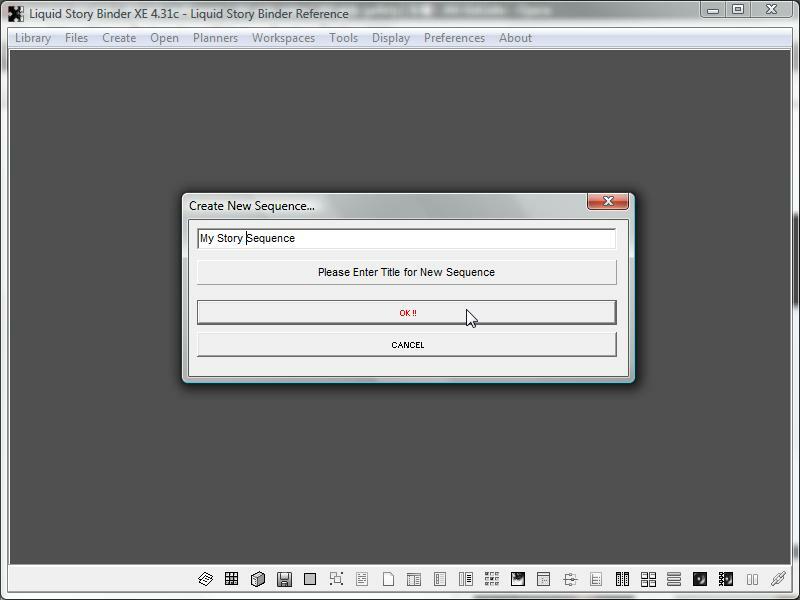 To create a new Sequence, choose 'New Sequence' from the 'Create' menu. Enter a title for your new Sequence. 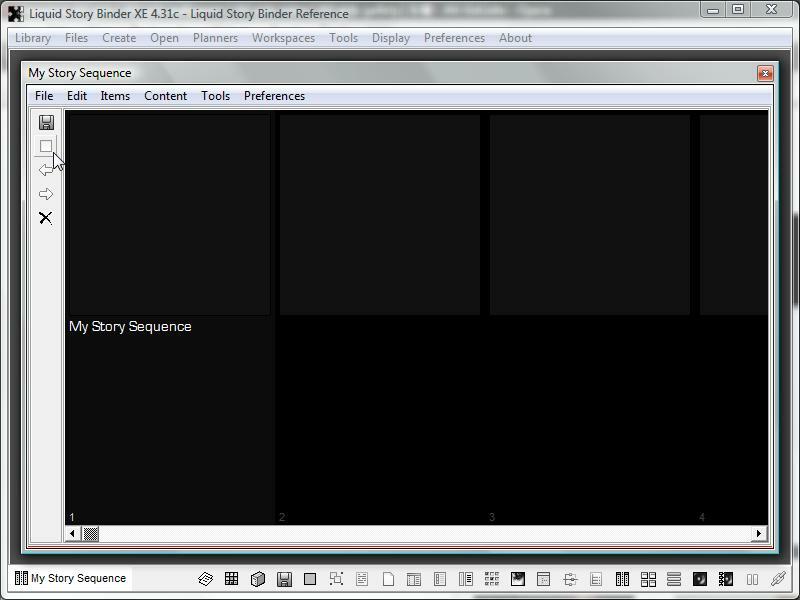 An empty Sequence window will open. Click the 'New Item' icon to add Sequence columns. 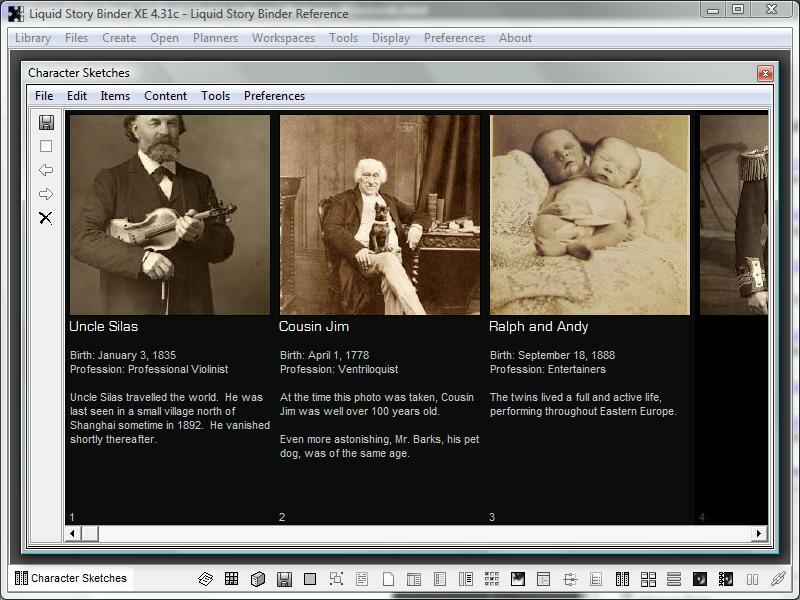 Each Sequence column can contain a single image, title, and caption. Double-click any column to edit its contents. Depending on what portion of the column you click, changes can be made to the image, title or caption. Images are taken directly from the opened book. 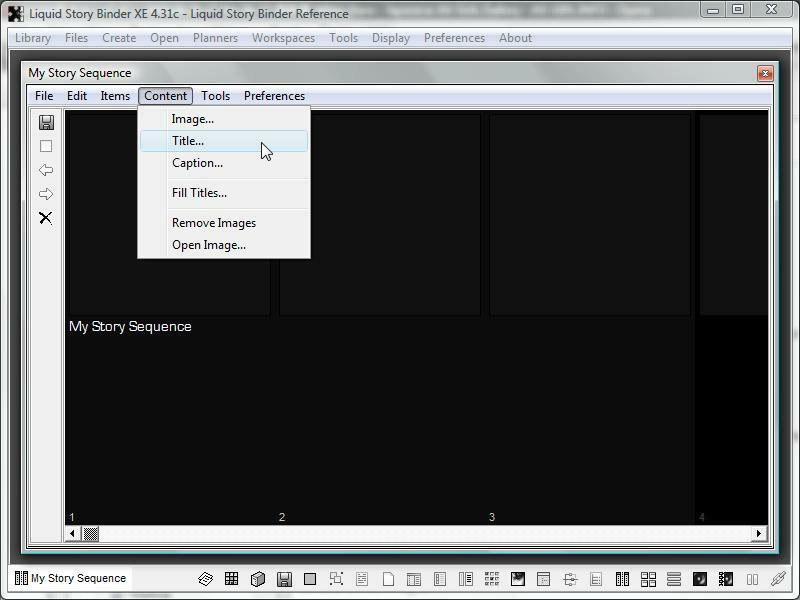 Hide Sequence images using the Sequence's 'Preferences' menu. 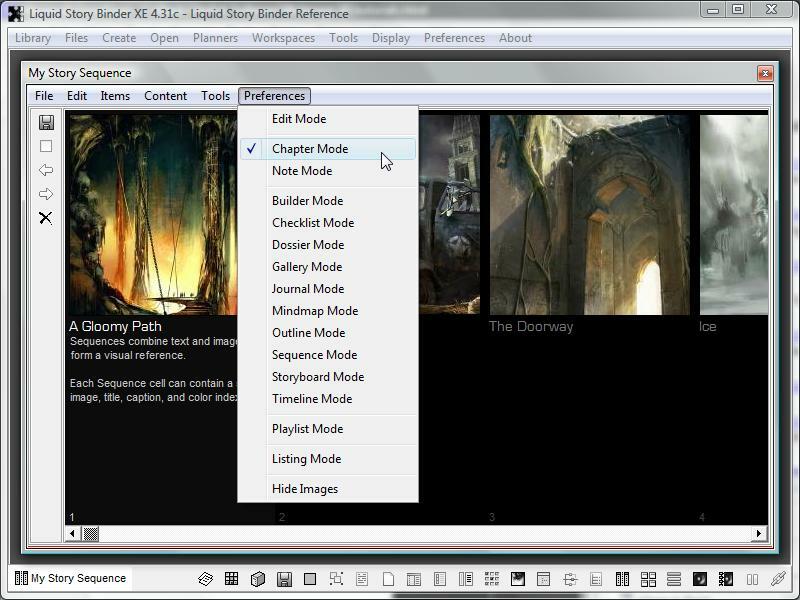 To change multiple columns simultaneously, begin by selecting the columns you wish to change by dragging the mouse. Now, choose 'Title' or 'Caption' (depending on the portion of the column you wish to change) from the 'Content' menu. 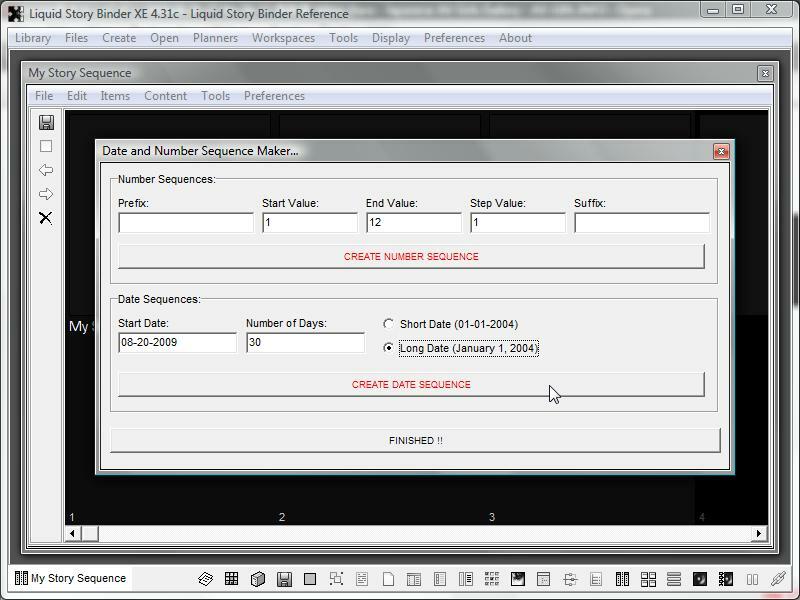 Quickly add sequential date and number information to your Sequence titles. 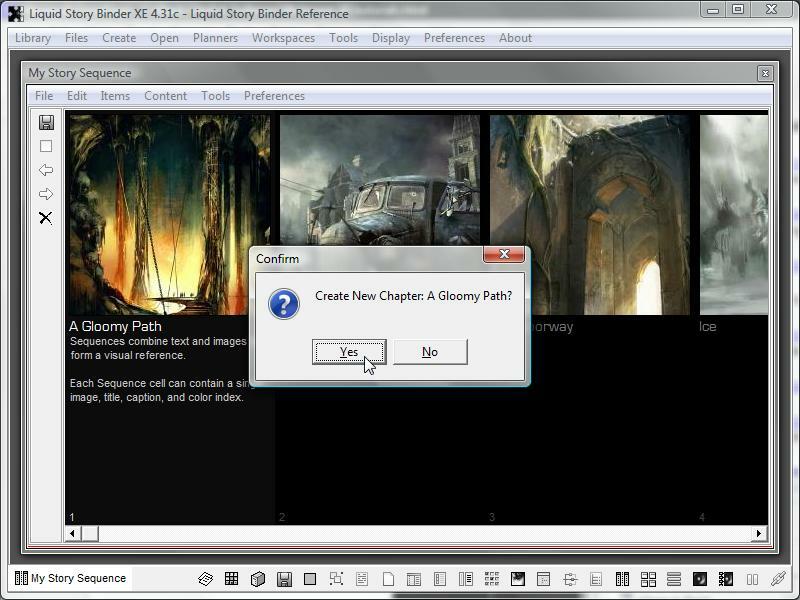 Choose ‘Fill Titles’ from the ‘Content’ menu to open the ‘Date and Number Sequence Maker’ dialog. To add a series of new numbered headers, use the ‘Number Sequences’ box. The ‘Prefix’ and ‘Suffix’ boxes allow you to add label information such as ‘Day 1’ or ‘Year 1’. The ‘Step Value’ box allows you to add a multiplier. For instance, a step of 1000 will increase the header number by 1000 (say for Year 1000, Year 2000, Year 3000). Click the 'Create Number Sequence' button to finish. To add a series of dates, use the ‘Date Sequences’ box. Begin by inputing a start date using the ‘Start Date’ box. The ‘Number of Days’ box determines the number of titles effected. Click the ‘Create Date Sequence’ button to finish. 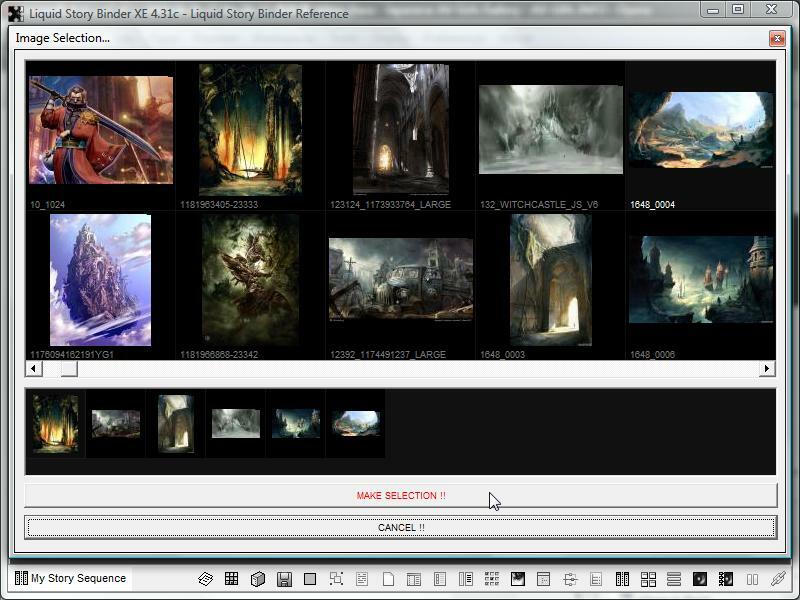 Liquid Story Binder XE allows you to add multiple images simultaneously to your Sequence. 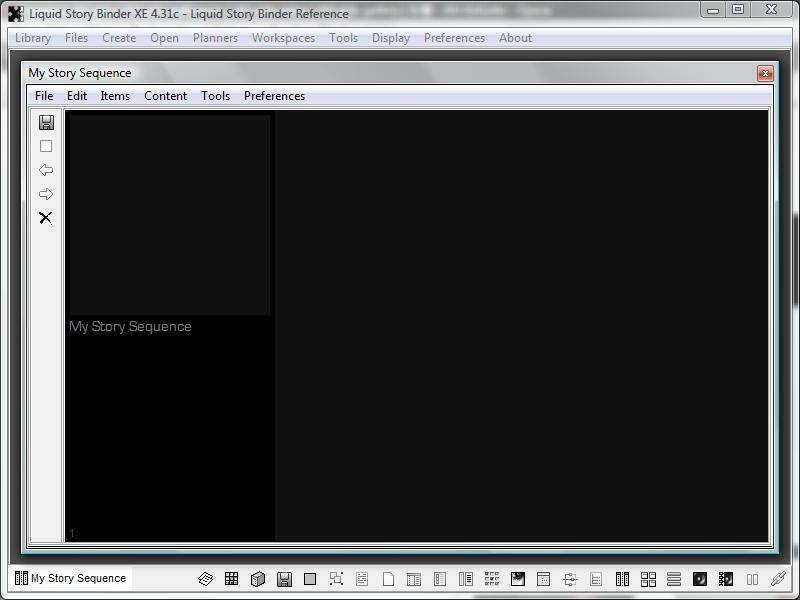 Using the 'Image Selection' dialog, choose the images, in order, that you wish to add to your Sequence. Click the dialog's 'Make Selection' button to add your chosen images. 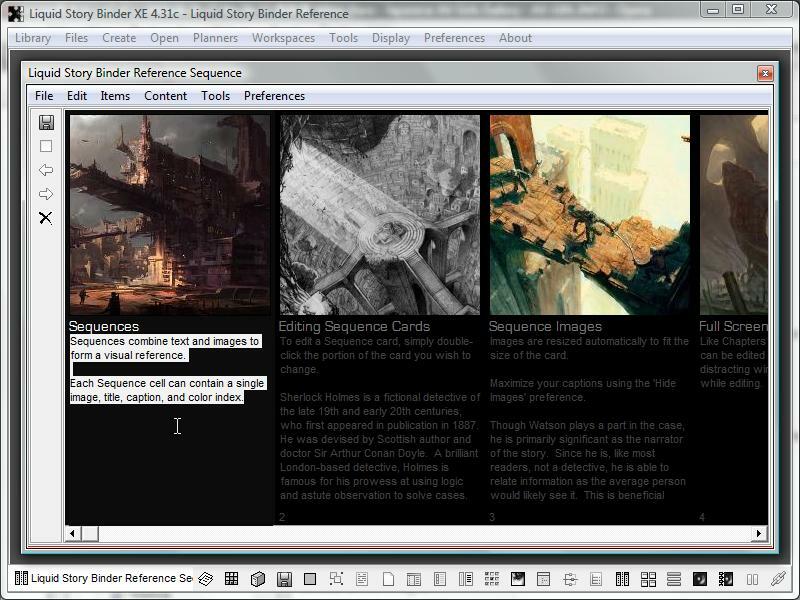 Liquid Story Binder will even add new columns to accommodate the number of new images. 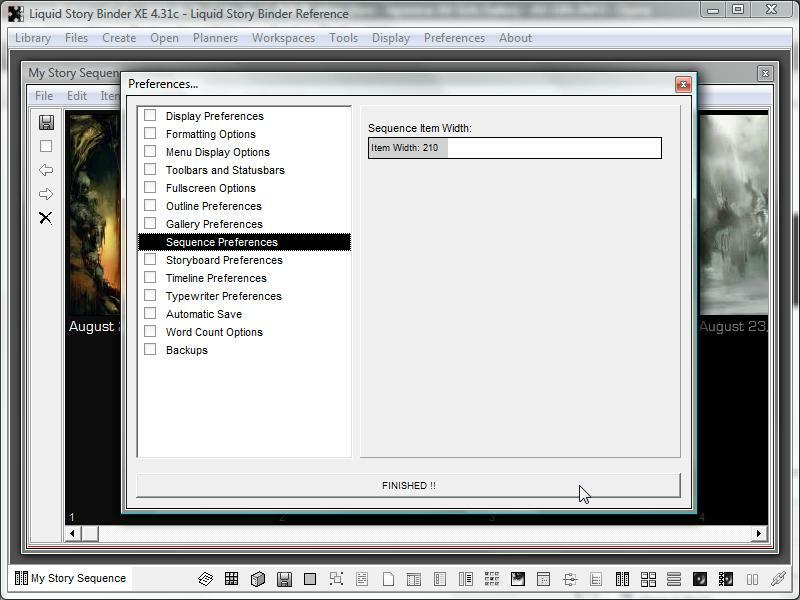 Use the Preferences Dialog to choose your preferred Sequence column dimensions. 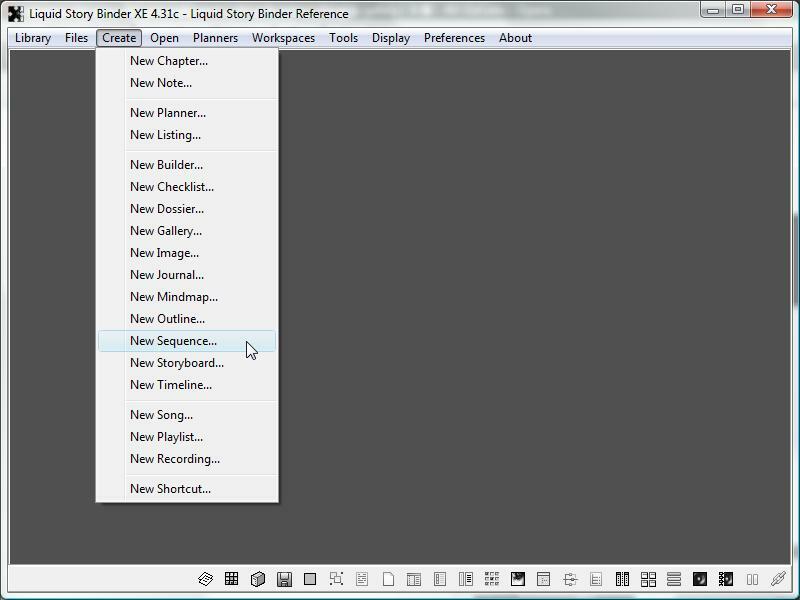 Like Planners, Sequences allow for the automatic creation and opening of different file types. Choose your preferred file type using the Sequence's 'Preference' menu. Double-click any individual column title to create or edit that type. Please note, 'Edit Mode' allows you to edit card titles without opening an associated file. Use this preference when outlining -- to quickly create and open Checklists or Outlines before writing your actual Chapters. Also, try using a Sequence to sort Dossiers into a family tree. Now when you double-click a column, an associated document will be created or opened. Use Sequences to organize character sketches.